I LOVE PATTERNS!! You know how some people collect fabric, I collect patterns. I like reading how the designer puts it all together, I like driving myself crazy trying to figure out a better way to make it. I like to think there's a pattern inside me just trying to get out. 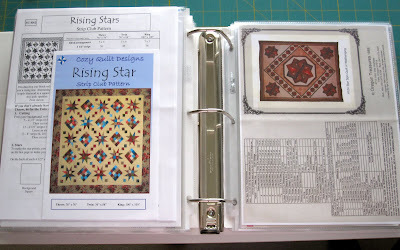 In my sewing room I have two binders for storing the individual patterns I buy or tear out of magazines. One binder holds over 100 patterns. 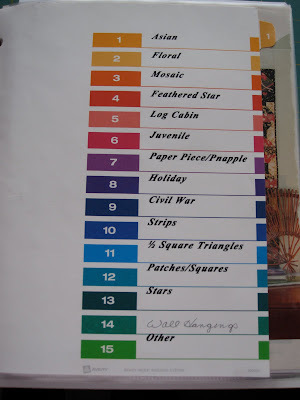 The patterns are divided into categories, like "Holidays", "Juvenile", "Big Blocks", "Stars". I think I have twelve different dividers. Once a year I go through this binder to reacquaint myself with the patterns and to reevaluate their appeal. So when the day comes that I need a "Star" pattern, I know right where to go for some options. I don't kid myself into thinking I'll make all these patterns, but I like having them. 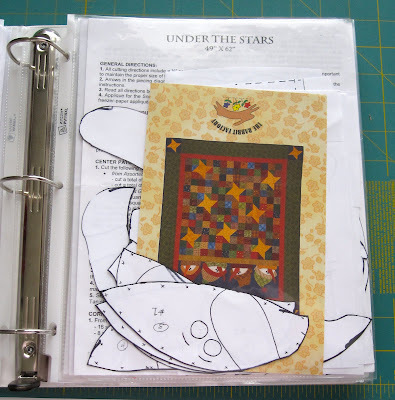 My second pattern binder is smaller, it holds maybe 15 patterns. 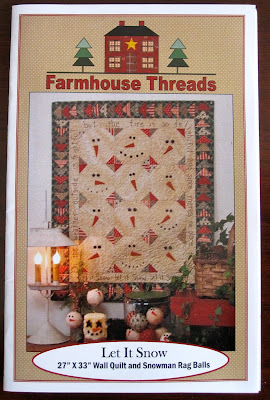 These are patterns I AM going to make, for sure! Like my top ten favorites, only there are fifteen. I like to grab that small binder every now and then and read up on the ins and outs of making each top. When I finish one quilt, I go right to that binder to pick my next one. So when I was at the "Road to California" quilt show, I was excited to see new patterns by familiar designers and new designers with different patterns. 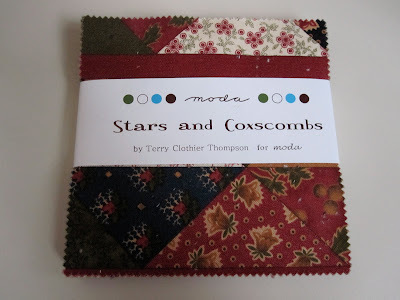 I think patterns are an easy thing to sell at a quilt show, they're light and portable. You rarely see bolts of fabric, it's mainly the bakery goods or kits. Most of the fabric I've seen online before I even get to the show, but the patterns, they're a whole new ballgame. 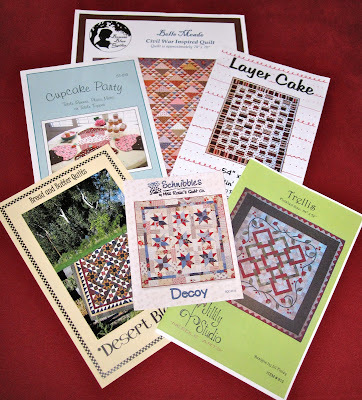 I bought 6 new individual patterns at the quilt show. 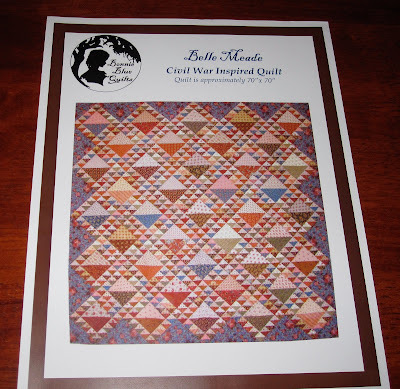 This pattern, "Belle Meade", is by Bonnie Blue Quilts. They had this kitted with "Rouenneries" by French General for Moda and I loved it. I've been thinking about doing an ocean waves pattern with my "Rouenneries" fabric, this pattern has an ocean waves kind of feel. The light and dark fabrics in the large HSTs really set it off. Plus I liked how the border fabric was worked into the blocks. I'm thinking this may be how I use my Rouenneries. It's going in the small binder. This pattern is made up of traditional blocks but the color combination and setting really appeals to me. This is "Dessert Bloom" by Susan Van Alyne and Janet Pierce for Bread and Butter Quilts. I could not find an internet hit for them but according to the pattern they are from Nevada. 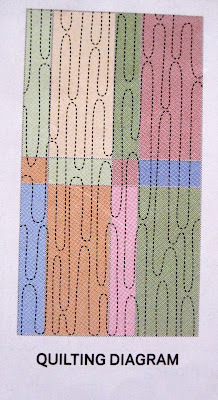 This is the first time I've seen Bread and Butter quilt patterns, it's going in the small quilt binder. "Trellis" is by Jillily Studio. Jill Finley, the designer, was at the show giving a demonstration on Appli-glue and has a tutorial on her website, along with all her patterns. 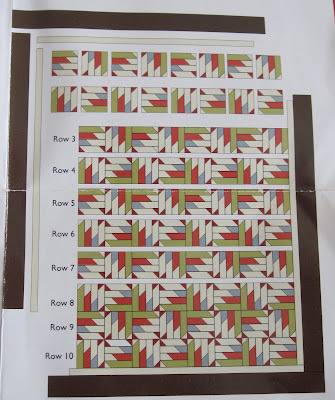 I liked how the piecing created the interlocking design of the squares and the applique around the border. I want to do a little more with applique and this is a step up from what I've done, but not over the top with pieces or complexity. It's going in the large binder, in the "Applique" section. "Layer Cake" is by Quiltin' Cousins from Pismo Beach, California. It looks like dozens of little chocolate cherry layer cakes. 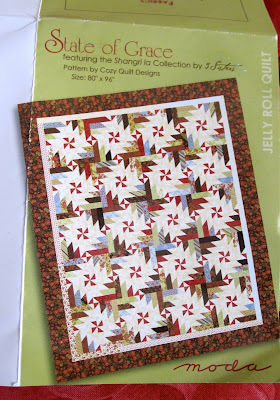 I'll need to collect some good browns and reds for this quilt, so it will go in the big binder for now. I thought these cupcake place mats by Susie C Shore Designs would look cute in my sewing room, this pattern went into the big binder. With a name like Susie C Shore I was expecting her to be from California, but she's not, she's from Arizona. And finally, a new to me Schnibbles, "Decoy".....what is it with me and stars? This one's just going to lay out in my sewing room for awhile because it's so cute......and maybe the next Schnibbles for "A Year of Schnibbles"???? My friend finished her top. She made it bigger AND added sashing, which I think really sets off those snowman heads. Great Job, I love it! Don't you just love confetti? Wouldn't it be fun to have confetti fall from the ceiling? Lose a pound...confetti all over your scales. Clean out the fridge...confetti all over the kitchen. Since I would probably be the official confetti sweeper, I'll guess I'll refrain from that home improvement. Last night I did get to enjoy a little confetti without worrying about the cleanup. For all you folks who don't follow football, the Indianapolis Colts did win!! That means we're going to the Super Bowl!! Well not "we" as in me, that would require a second mortgage, but the Colts are going. Woo Hoo! Thanks to all who left the most creative comments, I laughed and smiled all weekend as they came in. I'm sure your goodwill helped seal the deal!! I thought about splitting the fabric into 40ths, so every clever commenter would get a little something, but then I decided just to go with the original plan so four folks could actually make something bigger than a pin cushion. 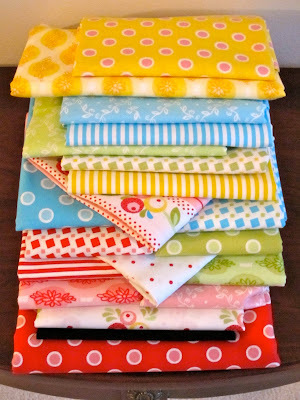 So each winner will receive this bundle of fabric. Please drop me a note or send a picture when you finish a project using this fabric, I'll be eager to see how you use it. And if setting it on your shelf and admiring it is your use, that's good too. I'm so happy this lovely fabric is going to get the chance to be something for someone! "D" left a very heart felt comment about Haiti, and she's right, we all need to be routing for the Haitian people and the volunteers who are trying to improve a horribly sad situation. This young man, Pierre Garcon, #85 for the Colts, has family in Haiti. His parents and 3 sisters were born there. As the Colts prepare for the Super Bowl, Pierre Garcon will be a reminder to please keep those people in our thoughts. The Red Cross was collecting donations at yesterday's game, and from the looks of their buckets, the fans were generous. 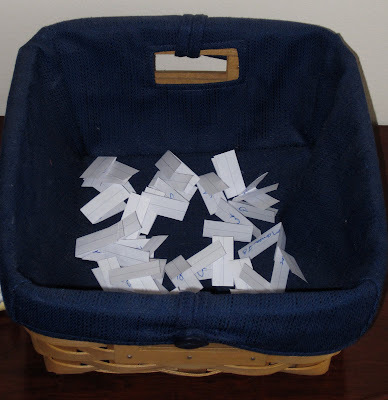 And finally, to Megan, the one commenter who is a New Orleans Saints fan, the team the Colts will face, Congratulations! What a wonderful thing for that city, Good Luck! 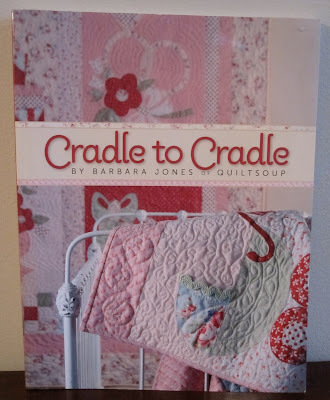 While at the "Road to California" quilt show last week, I was introduced to a designer who was new to me, Barbara Jones of Quilt Soup. 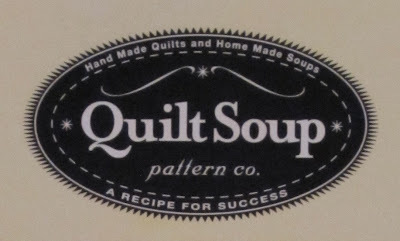 The name Quilt Soup comes from the designer's feeling that quilts and soup "both come from the heart". She designs patterns and fabric and includes a recipe with every pattern. The Quilt Soup booth was open, cheery and welcoming. Barbara Jones had quilts rolled and stacked in a basket that you could actually touch, she was OK with the touching and super friendly. and I bought it! 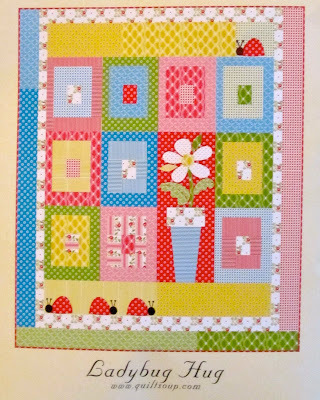 The patterns chronicle a girl's life from a baby quilt to big girl bed, grade school, junior high, engagement, wedding and full circle to another baby quilt. All the quilts are precious and girly. 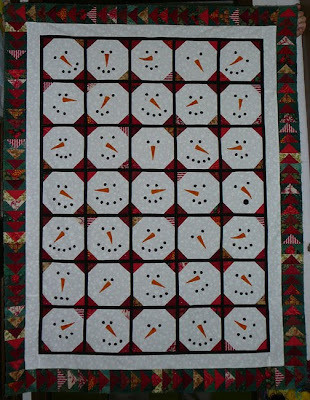 This quilt was on display in the booth, it was just adorable. It's the big girl bed pattern. I also bought this kit. The skill level for this pattern is listed as "Confident Beginner". 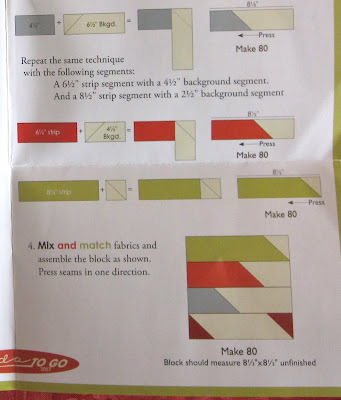 The cutting and sewing directions are detailed and clear. The free recipe is for watermelon popsicles. The fabric just screamed "Spring" to me. This is the fabric for the lady bugs! 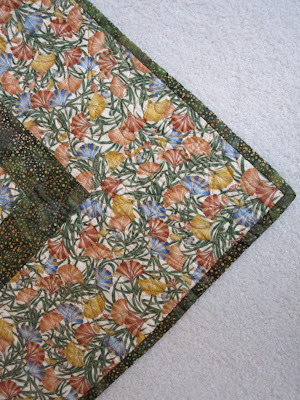 Barbara Jones was a molecular biologist before switching to a career with quilts. 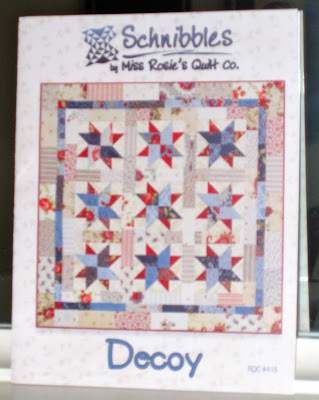 If you're in the mood for something light and cheery, check out her website and blog, it has free patterns along with fabric and all the patterns she has designed. Sinta over at the Pink Pincushion not only went to the quilt show, but she was organized enough to remember her camera. 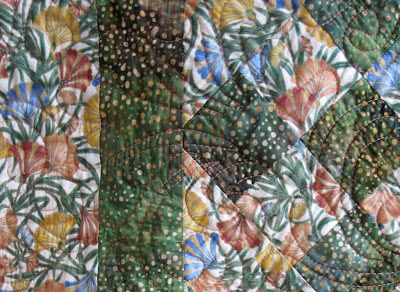 Hop on over for some great pictures of the quilts at the show.